VA Form 10-10072C or the "Renewal Application For Supportive Services Grant - Supportive Services For Veteran Families (ssvf) Program" is a form issued by the United States Department of Veterans Affairs. The form was last revised on August 1, 2012 - an up-to-date fillable PDF VA Form 10-10072C down below or find it on the Veterans Affairs Forms website. no adverse effect on benefits to which you might otherwise be entitled. Background: This form is to be completed by grantees applying for renewal of a supportive services grant. SSVF Program, the applicant must have received a supportive services grant award in the previous fiscal year. See 38 CFR 62.2 and 38 CFR 62.11 for definitions of the terms contained throughout the application. Instructions: Please answer the application questions in the space provided on each page of the form. in the application being rejected or not funded. 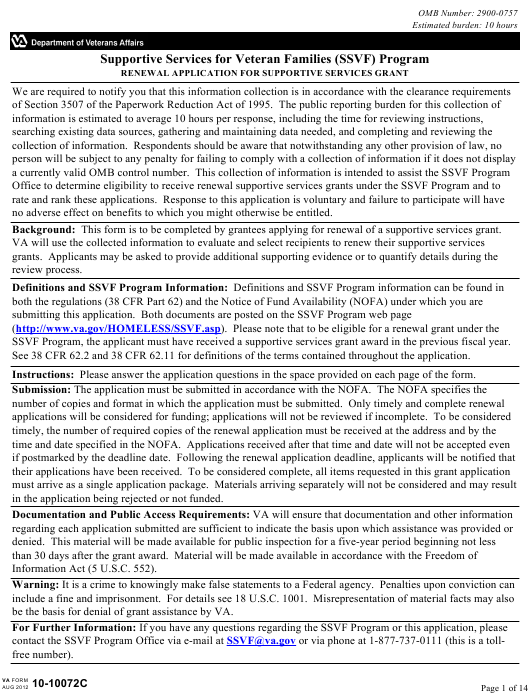 be the basis for denial of grant assistance by VA.
An application must include the following items. form. Limit your responses to the space provided. delinquent or in default on any Federal debt, in accordance with 31 U.S.C. 3701, et seq. and 5 U.S.C. Mailing Address (if different from above) - include both U.S. mailing address and courier (i.e., no P.O. 12. Applicant uses subcontractors to implement the SSVF program. additional year of grant funding (attach copy of certification). (see pg. 3 of application for a checklist). 62.30- 62.34 for list of eligible activities). income and are “occupying permanent housing” as defined in 38 CFR 62.11. Compliance with Final Rule: Applicant agrees to comply with Final Rule. have an overdue or unsatisfactory response to an audit. Is not in default by failing to meet the requirements for any previous Federal assistance. Is in default by failing to meet the requirements for previous Federal assistance.